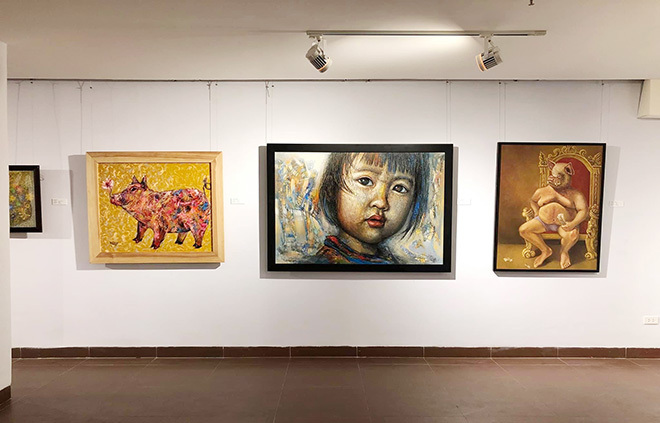 PSNews - Recently, the Da Nang Art Museum in collaboration with the Association of Art of Da Nang kicked off an exhibition themed "Spring of Year of the Pig 2019", at Da Nang Art Museum, Le Duan Street, Hai Chau District. The art exhibition "Spring of Year of the Pig 2019" introduces visitors over 50 artworks of 40 artists of Da Nang, which were made by various materials. The Pig is the twelfth of all zodiac animals. According to one myth, the Jade Emperor said the order would be decided by the order in which they arrived to his party. However a wolf destroyed his house so he had to rebuild it before he could set off. When he arrived, he was the last one and could only take twelfth place. In East Asian culture, Pigs with their chubby faces and big ears are signs of good fortune in life. Pigs are the symbol of wealth as well. 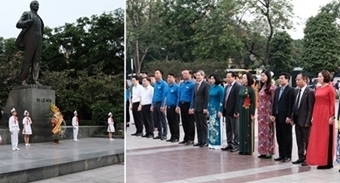 The organizing board hoped that the art exhibition "Spring of Year of the Pig 2019" would bring visitors a joyful atmosphere on the occasion of the upcoming Lunar New Year (Tet). The exhibition will last until February 14. In addition, a Pig-themed exhibition kicked off at the Vietnamese Women's Museum in Hanoi. The exhibition has been organised by historian Duong Trung Quoc, featuring 2,000 items. Each item features a different story, with some of the displayed items being collected from different trips. This is the first time that he has unveiled his collection to the wider public.